I was recently given the opportunity to review the new Funky Kidz CD. It is a great album for parents and kids to enjoy together. It features great, classic songs jazzed up New Orleans style. Submarine”), stylized and performed by a dozen of New Orleans’ stellar artists. Show with David Letterman and 2008 Sugar Bowl) and more. Below you will find the track list and artists. I was impressed by how many different artists contributed to this project! My personal favorite is Froggy Went a Courtin'. This is a rare CD in that the kids will love it and the adults will as well. most children's albums drive me crazy, but Funky Kidz was a rare treat. 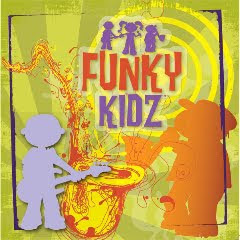 FUNKY KIDZ is available for purchase online at WWW.FUNKYKIDZMUSIC.COM, as well as various internet retailers and on itunes. I was also sent a wonderful CD called American Heroes #3. This is a great CD that teaches you about great citizens of our country's past. I've never heard a CD quite like this and became a fan of Jonathan Sprout quite quickly. 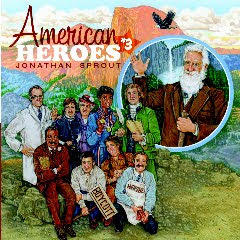 "Using musical styles from folk to pop to rock, Jonathan Sprout has created original songs about Milton Hershey (chocolate king/philanthropist), John Muir (conservationist), Elizabeth Blackwell (first U.S. female doctor), Dr. Jonas Salk (polio vaccine), Jane Addams (Nobel Peace Prize), George Washington Carver (agricultural scientist), Wilma Rudolph (Olympic gold medallist), Thomas Jefferson (third president), Pocahontas (peacemaker) and Cesar Chavez (civil rights activist). American Heroes #3 inspires children with not only the endeavors that brought these individuals to prominence but the personality traits that made their successes possible. Although Sprout’s carefully researched biographical anecdotes and historical facts are geared primarily for the enjoyment of elementary and middle school students and their families, the stories of these remarkable lives are an inspiration to all ages. At a time when Americans are looking for hope and inspiration, Jonathan Sprout reminds us that the keys to future success can be found in motivating stories of the past." This is a great album that will teach kids and adults alike a lot about these ten impressive Americans. I was very impressed by how much information was packed into each song. It was very entertaining and educational at the same time. For more information, check out www.jonsprout.com. Nessa, Thanks for your kind words about our American Heroes #3 CD! It took me three years to research, write and record, so I am especially grateful when people like you who have an influence with others are kind to the CD. It's been my life's work to help teach children about the difference between celebrities and heroes.